Object 477, Object 775, and Object-640 (Black Eagle) are three experimental Russian-built tanks that never went into mass production. Nevertheless, the unique innovations used in them form the basis for development of the Russian army’s modern combat vehicle – the Armata Universal Combat Platform. In the mid-1980s, engineers from several Soviet design bureaus decided to create a fighting machine with an unmanned turret. The new project compiled various proven and reliable service solutions and new unusual layouts of various components. The “Hammer”, according to its developers, was to have the most powerful cannon of that time; the 152-mm cannon, with impressive firepower for a weapon of this calibre, – 34/35 shots using various types of ammunition. The new trend in weaponry at the beginning of the 1960s was the creation of rockets – and their universal application. This trend did not bypass armoured vehicles either. In 1964, a group of engineers at the Chelyabinsk Tractor Plant headed by Pavel Isakov created the first Soviet “missile tank”, which was code named Object-775. Conceptually, this tank was not able to fire conventional tank shells. Instead of cannon, this fighting machine was equipped with a rifled barrel – a 125-mm missile launcher, from which were launched the guided missiles Typhoon and unguided rockets Bor, from the Rubin missile complex. Paul Isakov’s “missile tank” significantly raised the chance of winning battles, given the series of non-standard innovations used to design it. One of these was the hydro-pneumatic suspension, by means of which the already squat silhouette of this tank could “hug the ground”, thus reducing its height even more. 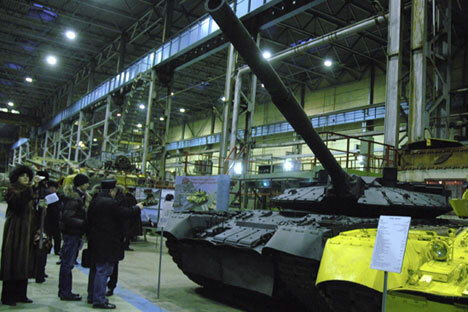 Despite the fact that this squat “missile tank” project never saw mass production, for the tank builders, a whole new area opened up in the development of these machines. A short time later, “tank destroyers” emerged, which differed from the earlier heavy machinery, with their compact size and powerful weaponry. The greatest attention in the modern history of armoured vehicles was garnered by a tank with a gas turbine engine. Object-640, which first appeared in the mid-1990s, could be airlifted to any required location. Object-640 also ranked high in terms of self-defence systems – in addition to its hefty modular armour and the “Cactus” dynamic protection system, the tank was also equipped with the active protection system Drozd-2, capable of shooting down incoming guided anti-tank missiles or rocket-propelled grenades launched from portable grenade launchers. Armoured military vehicles expert Sergei Suvorov explained why the tank never went into mass production. The article is abridged. First published in Russian by NTK Zvezda.